Anxiety is not caused by a biological problem with the brain, a chemical imbalance in the brain, or by genes. Anxiety occurs when we behave apprehensively. You can read more about this in the Anxiety 101 section. Behaving apprehensively, however, stresses the body. A body that becomes overly stressed, which we call stress-response hyperstimulation, can exhibit symptoms. You can read more about common anxiety symptoms by clicking on the link. Some people have found certain herbs, vitamins, and supplements to help in reducing symptoms of hyperstimulation. So, in this regard, while taking certain herbs, vitamins, and supplements can't eliminate issues with problematic anxiety, they can help you to feel better because of how they can counter the negative effects of stress and its symptoms. Since each body is somewhat chemically unique, there isn't a one-size-fits-all supplement approach to feeling better. 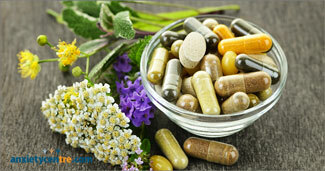 Often, one has to experiment to see how certain types of herbs, vitamins, and supplements will affect you. For the best results, we recommend talking with a nutritional therapist, such as our recommended Nutrition Science Practitioner, Liliana Tosic, for specific information about what may work best for you. If you believe taking a certain herb, vitamin, or supplement alone can eliminate anxiety disorder, yet it doesn’t, you may become disillusioned about what it takes to eliminate issues with problematic anxiety. You might also errantly conclude that, because taking supplements didn’t eliminate your struggle with problematic anxiety, your anxiety is different, and therefore, you’ll always have to live with problematic anxiety. Furthermore, if you don’t do anything to address the true cause of problematic anxiety, issues with anxiety will continue. Only when we address the core of the problem – the underlying factors that cause issues with anxiety — will the problem and its symptoms disappear. Anxiety disorder doesn’t resolve on its own. It takes getting the right information, help, and support, and doing the right work. It’s unrealistic to expect issues with problematic anxiety to disappear merely by taking a supplement. If you’ve tried herbs, vitamins, and supplements, yet your anxiety disorder remains, you may believe that your anxiety is untreatable, and therefore, your only option is a long-term struggle with stubborn anxiety. These conclusions can lead to despondency and even more anxiety, which can make things worse. But if you believe anxiety disorder can be overcome by getting the right information, working with a good therapist, and applying sufficient effort, the sky is the limit! Just the notion of believing you can succeed can make an important difference. All of us at anxietycentre.com overcame anxiety disorder by working at it, and with the help of an anxiety disorder therapist. A great many others have attained success, as well, which is why therapy is the ‘Gold Standard’ treatment for anxiety disorder. Anxiety isn’t about something you were born with, that you can’t correct, and that you have to somehow live with. Anxiety is about behavior that all of us can change when we know how. Working with an experienced anxiety disorder therapist is the most effective way to learn these important skills. Anxiety isn't something that needs to be cured because it isn’t an illness or disease. Dealing with our apprehensive behaviors solves the entire anxiety disorder problem. Anyone can do this work with the right information, help, and support. No one needs to suffer needlessly or persistently! There is experienced help available. The road to meaningful recovery is clear, well known, and well-traveled. We can help you with your success…and every step of the way! anxietycentre.com: Information, support, and coaching/counseling/therapy for problematic anxiety and its sensations and symptoms, including the anxiety myths: taking certain herbs, vitamins, and supplements can cure anxiety disorder.